What you need to know about GoPro's February. What: Shares of action camcorder maker GoPro (NASDAQ:GPRO) fell 19.5% in February, according to S&P Capital IQ data, as Mr. Market ignored a positive quarter and disappointing first-quarter guidance, a surprise C-level executive departure, and a lockup expiration took their toll on the stock's returns. 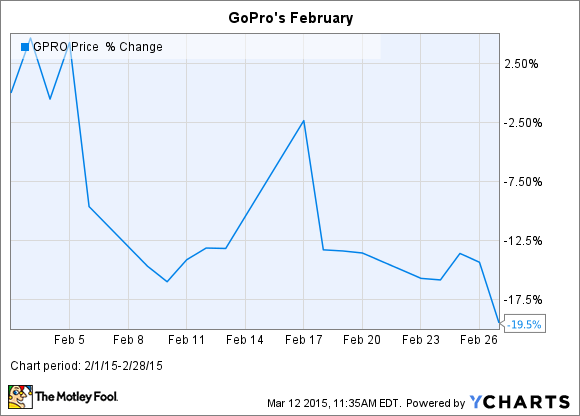 Now what: GoPro's story can be best summarized by the first downturn. After playing up its social-media ambitions, without a well-formed plan to monetize content, the stock was bid up to atmospheric valuations any consumer electronics company would have problems maintaining. And that's why GoPro fell 12% after blowing past analyst expectations, because so much growth was baked into its valuations. Considering the company is now valued at less than half of its all-time highs, the stock is no longer dependent on eye-popping growth to enrich investors. Recently, I took a position in GoPro as I feel the falling stock price -- it's continued to fall in March -- and incessant bullishness has worn off and the company continues to operate well fundamentally. GoPro will continue to be a volatile stock, but I feel its brand cachet and unique value proposition will enrich patient, long-term investors.